Fast forward a few years of practice and a couple hundred dogs later, and I could make any dog look amazing. When I did a simple haircut on a pet, the fur fell away like a hot knife through butter. The end result was smooth and appealing. I could finish dogs in no time. I’d gotten very efficient with my clippers. Use the most powerful clipper you can afford and are comfortable holding. Duel speeds or variable speed clippers are great options. Work with the natural lay of the coat. You can work with or against the grain. If you reverse clip, the end result will leave that fur approximately two blade lengths shorter than working with the natural lay of the coat. For a large majority of low maintenance trims done with a #4F, #5F, or a #7F blade with the grain, you will go over the pet three times before it’s really smooth. The first time removes the bulk. The second time takes out the high spots. The third time erases what you missed. The strokes are long and smooth. They overlap slightly. 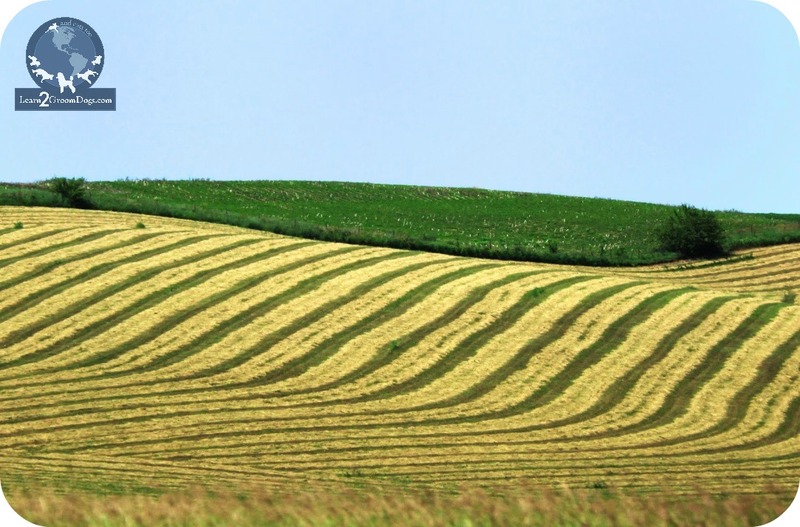 I often tell students to think about a hay field. The farmer wants to be as efficient as possible – but he doesn’t want to miss anything, either. 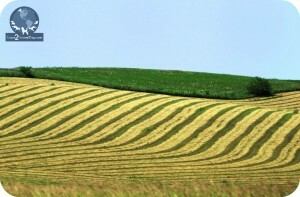 Most farmers work in nice, neat rows as they cut hay, slightly overlapping each row to ensure they don’t miss any portion of the field. Think about the dog’s body in the same manner. It’s a hay field. Your clipper is the tractor. You want it done right… and you want to be done before the dinner bell rings. When clipping the legs, remember the actual contact of the cutting blade is minimal due to the shape of the surface. It’s round – like a pencil. Only a few teeth will make contact with the surface as you run the clipper down the leg. Thus, on legs you need multiple passes to get the same effect as three passes on the larger flat surface of the body. You can clearly see this relationship by simply running a blade down your own finger and looking at the blade’s point of contact. Back brush. Back brush. Back brush! 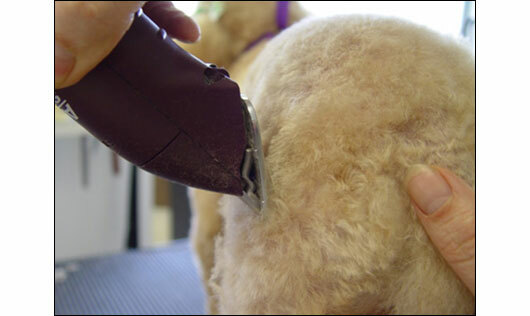 You’ll always get a smoother cut on a dog that is clean and the coat has been fluffed. Once you make the initial pass to remove the bulk of the long coat, it’s time to pick up the brush. Back brush the entire dog and go over it a second time. On the third pass, again gently back brush the entire area that needs final attention. Did you get that? Back brush! When do you know you are done? You are done clipping when there is no more coat coming off the dog after it has been washed, dried, and effectively back brushed. Period. Need specific information fast but don’t want to lose too much time at the table? These lessons are for you!